How can a series of murals on the ends of the LA River represent the story of Frogtown? Rio Vistas is a project for River LA to transform streets ends into vibrant communities spaces. In Frogtown, the LA-Más office stands at one the Rio Vistas, and as mural designers, we had the opportunity to share a story about the community, to inspire speeding bicyclists to slow down, and to name streets that were signless. Incorporating community feedback, the five murals on the three street ends – Clearwater, Coolidge, and Newell – represent the evolving industrial icons of the community. Together, they show the diverse landscape of Frogtown, tucked below the hills of Elysian Park and along the LA River. Elysian Valley United was once a sweatshop. Aeroengines closed in 2015 and will soon be home to new live/work spaces. Both Bimbo and Hostess Bakery will be adaptively reused. These murals were completed in April 2016. 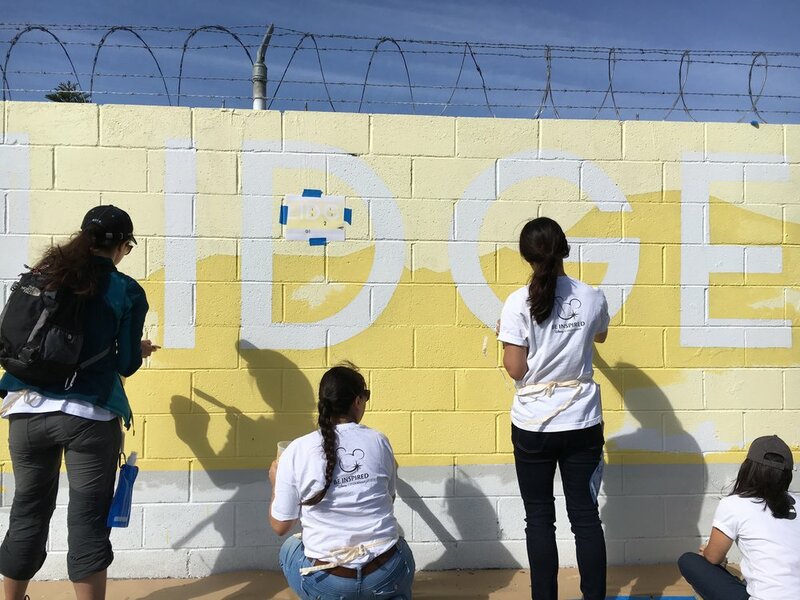 With the intention of having community members and volunteers paint these murals, they were designed to be supergraphic-like, and thus easy to paint and maintain. Next time you’re in the area, stop by our office to say hello!